Want to read this case study later? Download a PDF! The Association of Professional Social Compliance Auditors (APSCA) was established in 2015 to enhance the professionalism, consistency, and credibility of individuals and organizations performing social compliance audits. While APSCA is still a young association, the social compliance industry has been in existence for more than 20 years. APSCA is the sixth attempt to professionalize the industry and the first to find success. Today, APSCA consists of over 3,200 auditors and 40+ member firms across 93 countries, and it is still growing. A major goal of APSCA was to create a standardized global certification program. 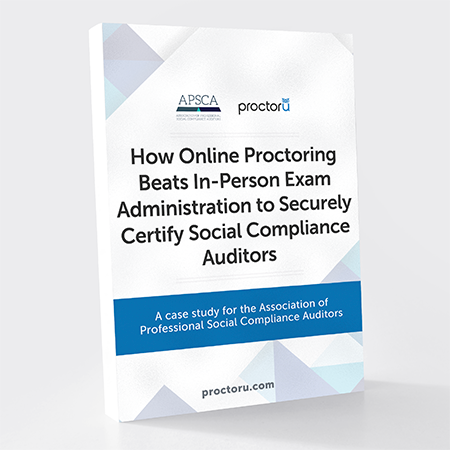 This led to the development of the Certified Social Compliance Auditor (CSCA) program. To be designated a CSCA, an individual must pass a three-part examination and meet minimum experience requirements stipulated by APSCA. Scalable to reach over 3,200 auditors across 93 countries. With five failed attempts to professionalize the industry, it was critical that APSCA succeed and find a credible solution to meet all of their requirements. Starr admits that she was very anti-online proctoring at the beginning of the process. However, as a direct result of what she saw during face-to-face pilots, she began looking for other options, and online proctoring soon rose to the top of her list of alternatives. 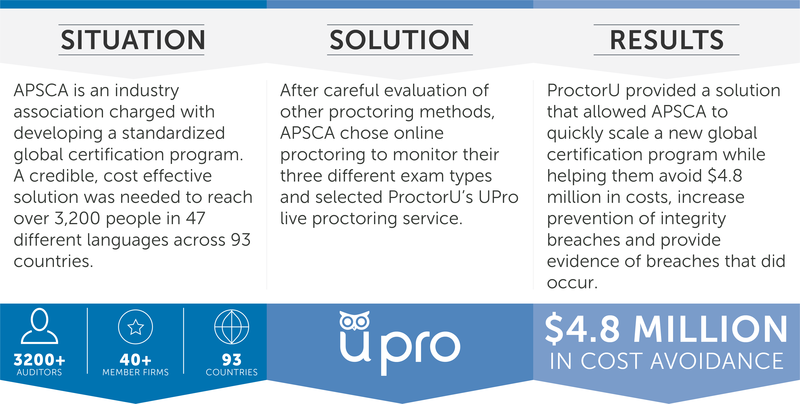 After investigating the players in online proctoring, APSCA decided to put ProctorU to the test…literally. Starr signed up a few of her team members through the ProctorU system and instructed them that their sole purpose was to cheat in the most subtle ways possible and see what happened. The outcome was positive. 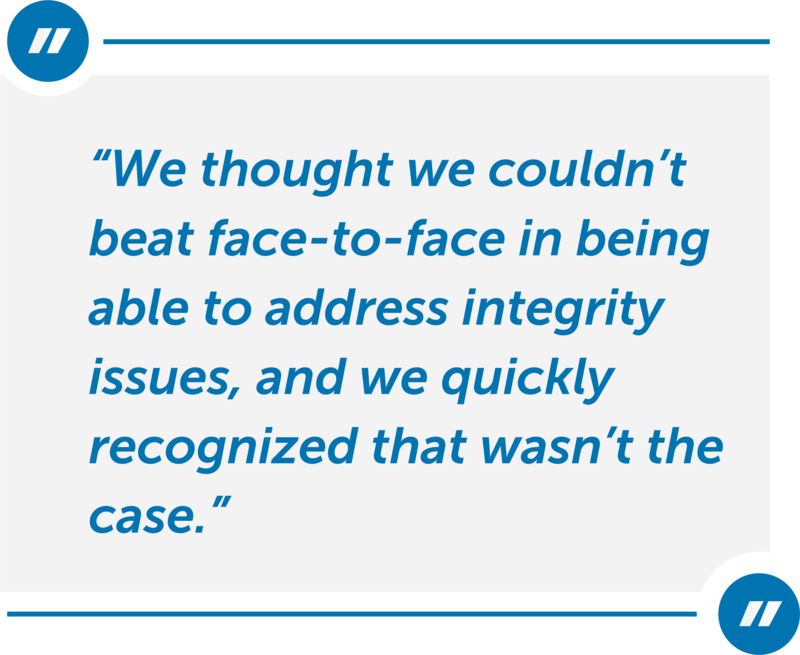 In addition to meeting the initial requirements of quick, scalable and cost-effective, Starr identified several other areas where the UPro live proctoring service exceeded her expectations. The ability to identify and proactively eliminate integrity issues translates to value and added credibility for the CSCA credential. 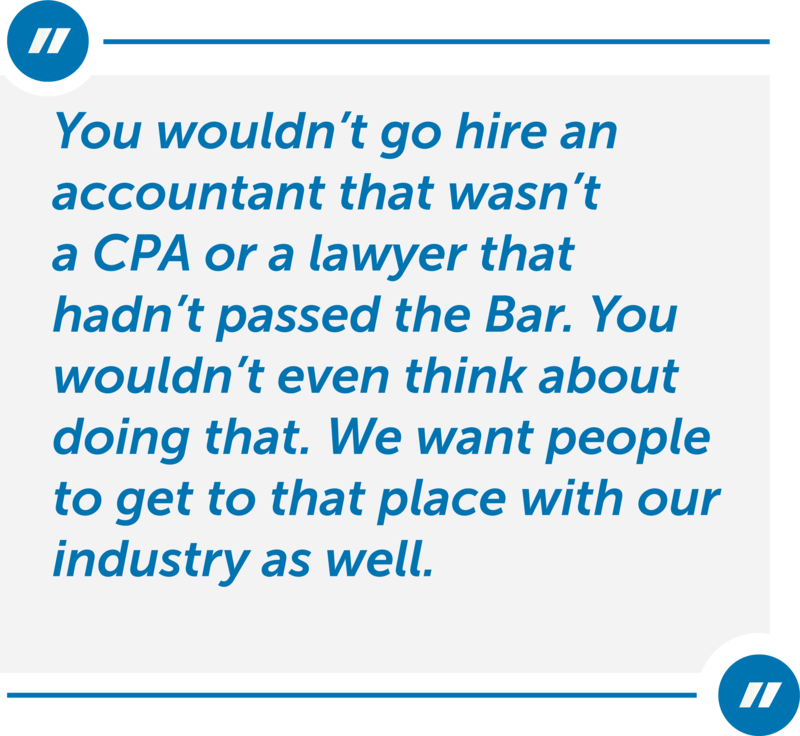 “The more credibility that we can build and demonstrate to the people that are asking for APSCA certified auditors, the better for us as an industry association,” explains Starr. A benefit Starr is most excited about with the transition to online test administration and proctoring is the cost avoidance recognized by APSCA and their member firms. She estimates that the association is saving at least $500 per auditor, per exam. With three exams to administer across 3,200+ auditors, that comes out to a minimum savings of $4.8 million for APSCA. That number doesn’t take into account the money saved by the member firms not having to pay travel expenses (flights, cars, hotels, food, etc.) for each auditor to go to a physical testing center. Furthermore, the estimate doesn’t include the time each auditor would have to spend away from work when traveling to a physical test center. Considering these variables, the quantifiable cost is much higher than APSCA’s estimated savings of $500/auditor/exam. When an integrity issue comes into question at a physical testing facility, it can be difficult to definitively prove the series of events due to hearsay. Starr recalls one integrity issue from the face-to-face pilots that took a very long time to close out because it turned into a he-said, she-said situation. “The proctor says, ‘This is what I saw.’ The test-taker says, ‘No, this is what actually happened.’ It’s very difficult to close that out.” Full recordings of a test-taker’s face and screencast plus the chat logs make it very clear and nearly irrefutable when an integrity breach is suspected. A unique challenge faced when creating a global exam process is language. APSCA auditors speak 47 different languages, with 10 of those being spoken by only one person. This is another specific area where Starr values the collaboration with her ProctorU team. “ProctorU has been great in thinking about how we’re going to do that, but I also think it’s going to be one of our biggest issues,” she says. 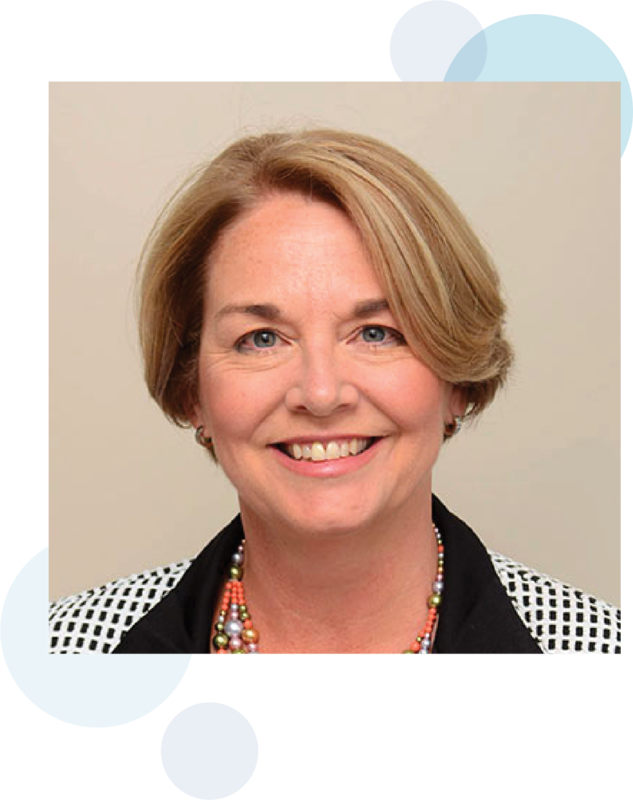 With all the challenges faced by previous associations trying to professionalize the social compliance industry, Starr and APSCA felt tremendous pressure to make the global standardized certification a reality quickly, but in the most credible and cost-effective way possible. They’re now certain online proctoring through ProctorU Pro was the only way to meet all of their objectives. Want to take this case study with you? Download a PDF!